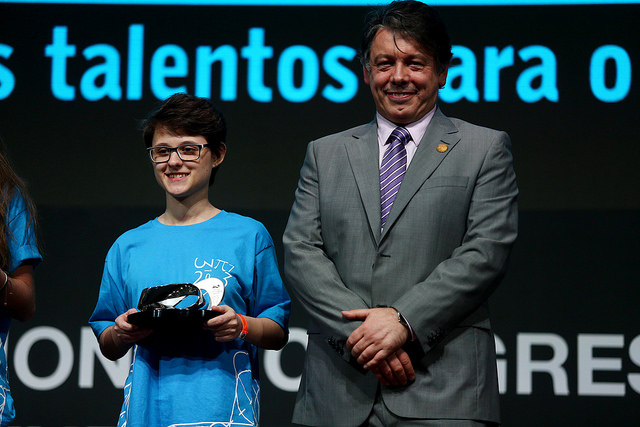 A grand celebration was held in Riocentro this evening for the young winner of gold medals in the OBMEP (Brazilian Math Olympiad for Public Schools), the largest competition of its type in the world. 518 students from all over Brazil received their gold medals on the same stage that the Fields Medals were awarded only yesterday. Among the dignitaries attending the ceremony this evening were representatives from the Rio de Janeiro Education Secretariat, Brazilian Pure and Applied Maths Association (IMPA), Government of the State of Rio de Janeiro, The Brazilian Academy of Science (ABC), Brazilian Society for Progress in Science (SBPC), OBMEP, Brazilian Mathematical Society (SBM), national research funding agency CNPq, Brazilian Development Bank (BNDES), and Itaú Social Institute. Three Fields Medal holders also participated in the event; Brazilian Artur Ávila, Italian Alessio Figali, and Frenchman Cédric Vilani. Drum band Afrolata, from Rio’s Vigário Geral community, who use drums made form recycled materials helped liven the atmosphere in the massive pavilion, filled with excited friends and family of the young winners. OBMEP Coordinator Claudio Landim brought the exciting news that the innovative math test will be administered to children in the 4th and 5th grade of elementary school from 2018. Currently, the test is applied to all children from the 6th grade onwards, including students in middle school. Rio de Janeiro Education Secretary, Rossiele Soares da Silva told the talented young people that while the Brazilian football team could have won the World Cup, he was prouder to see them winning their medals today at ICM 2018. He gave a special mention to the female winners of the competition, and the assembled crowd erupted into applause. “We need more girls in the exact sciences,” he said, congratulating them enthusiastically. A special IMPA prize was awarded to the girls with the top grades in three levels of the competition. 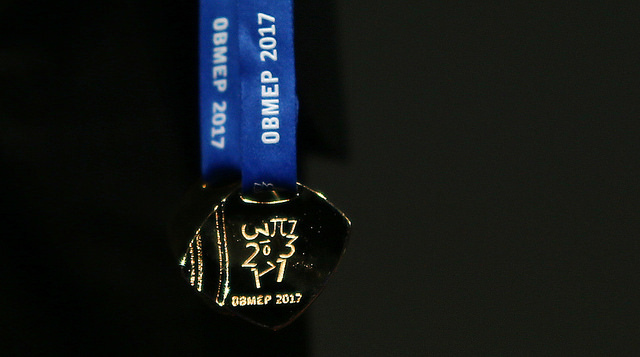 The winners of the OBMEP Olympic Girls prize were Raissa Cássia de Souza Ortega, from Curitiba, Paraná; Lais Nuto Rossman, from Fortaleza, Ceará; and Fabíola Loterio, from Santa Teresa, Espírito Santo. More than 6000 math professionals from more than 80 countries around the world are in attendance at ICM 2018, marking the first time the biggest math gathering in the world has been held in the southern hemisphere.